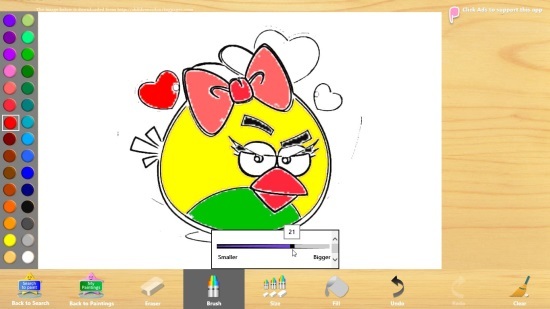 Happy Coloring is a free Windows 8 coloring book app that allow kids to have fun coloring on computer. The app comes with an integrated Bing search that can be used to search for coloring images online, and use them within the app for coloring activity. The app provides a canvas on which the image can be placed, and some drawing tools like brush,eraser, paint bucket, etc., using which one can fill colors in the picture. There are many coloring book apps we have reviewed earlier, but what makes Happy Coloring unique, is its powerful Bing search. The Bing-enabled search not only helps in accessing hundreds of pretty coloring images online, but also other interesting activity sheets you can involve your child with; tic tac toe, maze, and difference finding pictures are some common examples. Happy Coloring is available in the Entertainment category of Windows Store. Let’s see how this app works. As you launch the app, you would be taken to the welcome screen where you would see two smiling stars: one to search for coloring pictures online, and other to see the drawings you have colored so far. A melodious music also keeps playing in background, which creates a very friendly environment for kids to work with the app. To begin, you can straightaway click on the the “Search to Paint” start. This would take you to a screen where you can search for a particular character’s coloring images using the search bar at the top. For outlined-images, you need to enter “Color + [character name]” in the search bar. If you search without the “Color” label, the results would contain colorful images. 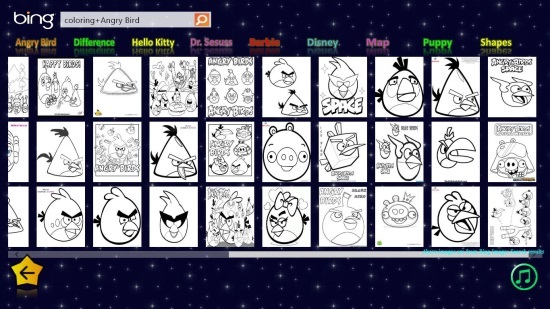 You can also click on the links below the search bar (Angry Bird, Hello Kitty, Disney, etc.) for a quick search. Once you specify the search term and press Enter, a search would be initiated and results would start displaying one by one on the rest of the screen area, as thumbnails. You can click on any of the desired image, and that would be downloaded on the canvas, for you to color. This canvas would appear on the next screen along with some coloring tools like color palette, brush, paint bucket, eraser etc. Brush size can be adjusted for ease of painting and multiple undo redo can be performed whenever required. A “Clear” tool is also available that can be used to clear the entire painting and start coloring from scratch. 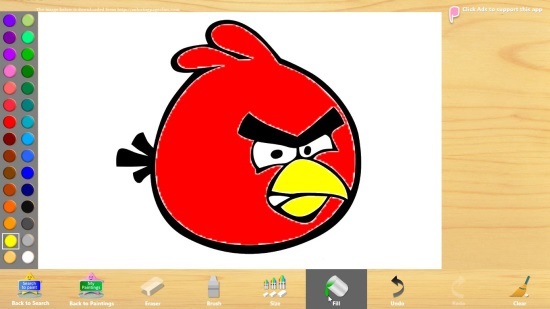 Free coloring book app for Windows 8. Simple and fun to use. One click donwnload of image to canvas. Kids-friendly canvas with sufficient coloring tools. Nice background music play during search. Happy Coloring is a very good coloring book app for small kids. Not only it helps in keeping them engaged in free time, but also helps in improving their drawing skills and creativity. Download it now and let your child have some happy coloring time. Do share your experiences and suggestions via comments.